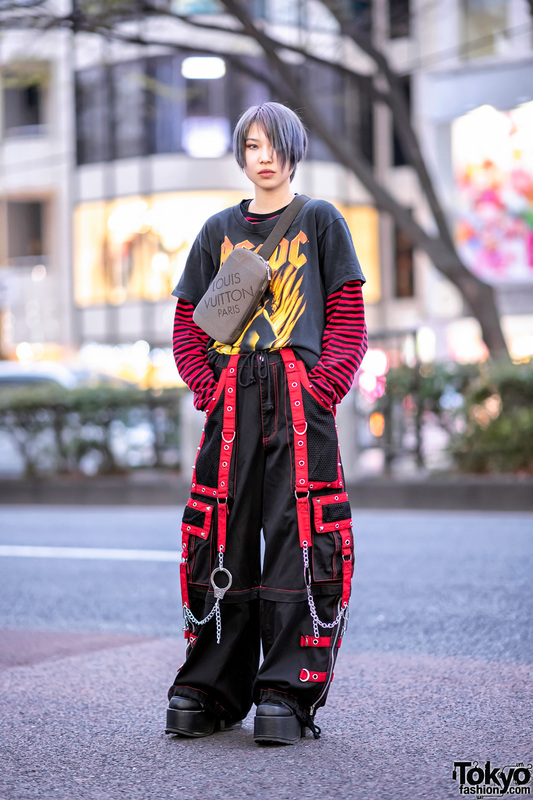 Jaycee is a 15-year-old Japanese model and student who we often see around the streets of Harajuku. She is one of the rare Harajuku kids who can speak both Japanese and English fluently. Jaycee is wearing a vintage purple faux fur jacket over a blue Fig&Viper crop top, a Kate Spade graphic skirt, and heeled boots from Forever 21. Jaycees blue purse is by Victoria’s Secret and her purple tinted glasses are by Police. Jaycee told us that her favorite fashion brands right now include YSL and Alexander Wang. She listens to the music of Cardi B. Follow her personal Instagram for more of Jaycee’s fashion.